Horns pitched to sound like strings; strings played low and swinging like horns; a pot-pourri of roughly Caribbean percussion – instrumentally, “The Tide Is High” is delightful escapism. Even so it’s a little bit of a let-down. Debbie Harry gives a gentle, intimate performance, but gentle intimacy isn’t really what you go to Debbie Harry for. Once she savaged her rivals and dismissed her lovers, now she’s playing a long game – with supreme and justified confidence, of course, but the woozy, flippant Blondie on show here lack the flash and fire of previous encounters. “Tide” is a postcard from a band on holiday, something to cheer up a dreary Autumn: the holiday just ended up a little longer than anyone thought at the time. This is the first record I can definitely remember seeing on Top Of The Pops at No.1 (as a video I think). I remember thinking that the swell of horns at the end of the chorus was very like the To The Manor Born theme tune. I have in the past liked this a lot more than I do now: it’s an example of a slight record that ought to be the kind of thing that puts a smile on your face when it shows up on a greatest hits – oh, I’d forgotten they did this one! But instead it’s up there with Heart Of Glass as one of the most-played Blondie tracks, and the weight of exposure doesn’t help it at all. It’s hard to dislike this, but its a bit minor – the type of exercise that would be best discovered as a B-side, rather than the trailblazer for a major new album. That said, there was a surprising clip on the BBC’s Blondie documentary a few years ago of them performing this on a late night New York amateur cable station, with – I think – squeaky toys and toy drums for instrumentation. Played by an underground art project to a coitery audience, this made a lot more sense than as a glossy pop project. TOTP showed a small bit of the proper video when it hit the top 10, but made their own montage version (with flying “number one”) when it hit the top. I don’t know why. Blondie’s most boring single (until the reunion, at least). I don’t mind the mugging – it adds to the relaxed ambience innit. A shame this got to #1 and Rapture didn’t, from a something-to-write-about point of view anyway. One of two consecutive number ones to refer to being “number one” in the lyric – 13 year old me saw this as significant. I’m not sure how intentional it was from either act, particularly as this was a cover. I remember John Peel digging out the John Holt original, performed by the Paragons, and implying that Blondie were somehow less than virtuous by covering an old reggae tune (but I may be doing JP a disservice here, it’s a long time ago. It’s not a stance that would have made much sense given plenty of UK acts played by Peel covered reggae themselves, notably The Clash. Then again, Peel was never one to champion acts once they became commercially sucessful, with one or two well know exceptions). Anyway, as a huge Blondie fan I had been looking forward to this record for sometime and therefore I willed myself into liking it, even though it all felt a bit underwhelming. I rushed out and bought this on day of release – the pic sleeve was not the one shown above, but an extract of the forthcoming “Autoamerican” sleeve – a painting of Debbie in mini-skirt leaning against a wall. The album was savaged by the press. I got it as a Christmas present – hated bits of it, and loved others (“Rapture” was the obvious highlight). I’ve come to love the Paragons version that this feels almost redundant. Still Blondie’s does have possibly the most WTF video of the entire decade. Covered by many, including Billie Piper no? I don’t know the ‘Auto-American’ album at all so does this fit in with some overall theme on it? It seemed such an odd choice for them at the time, after futuristic disco and new wave pop to do an old reggae chestnut. Not essential Blondie by any means but I like it’s sunny nonchalance. Reggae was made to seem so earnest and heavy at this point (The Clash, UB40 etc.) it was nice to be reminded it was also tropical island music. Lee, “AutoAmerican” is a real mixed-bag of styles so in that sense “Tide Is High” fits in nicely! Take your pick from – electro instrumental (“Europa”), 40s style jazz standard (“Here’s Looking At You”), rap (“Rapture”), a Lerner & Loewe cover (“Follow Me”), classic Blondie disco (“Live It Up”) and the Oriental sounding funk of “Do The Dark”. The 1982 comeback single “Island of Lost Souls” was very much in the same vein as TTIH – an upbeat, gentle reggae lilt. The wheels rather came off the Blondie bandwagon with this one, for me at least. Not commercially obviously and I do remember this as one of those inescapable, huge hits. But, my God, its weak. Almost everything that made Blondie’s greatest great has been removed – no bite, no transcendent pop rapture, no energy. Their decline from here on in was rather rapid and rather complete. Slated album, with Rapture standing alone and awkward as a memory of something with character and innovation, followed by the almost farcically terrible ‘Island of Lost Souls’ and parent LP. And Rapture itself, which as Tom has said would merit a more interesting discussion than this one does, underperformed chartwise at the time (#6 or something?) and, even at the time, sounded more like a piece of pop theory than a real hit. Every track on a Blondie greatest hits puts a smile on my face – especially the duet with Iggy Pop on “Well Did You Evah!” This one’s no exception, and shows that they can do slinky and exotic too. She looked as hot as ever in the video, although that cover pic is a bit ropey. And that’s it for Blondie number ones for close on two decades. Steve M – are you thinking of the Atomic Kitten cover rather than Billie? Well put #11..I dunno how great bands lose their inspiration and magic so fast and easily,but here go Blondie into mediocrity..This is really bland n lazy..
#7 – my eight-year old self quite liked this, but thought that it wasn’t as exciting as ‘Atomic’. There are some half-decent things happening in “The Tide Is High”, rhythmically at least, but it’s a very limp single, isn’t it? Aside from being fiendishly catchy, it doesn’t do much that an A-side should. Just sort of sits there scratching itself in front of you, then wanders off smirking at the knowledge that it’ll be in your head for the rest of the day. And this is not enough: I remember an old letter to Melody Maker from a bloke who’d been working near Camden station, saying that the all-day cry of “lighters, three for a pound” had stuck in his head all week, but this didn’t mean it had improved his life in any way, neither was he on his way home to listen to a recording of it. It’s a shame, bearing in mind what came before. This is the cut-off point for Blondie and me, really, as it was for many – I like the texture of “Rapture”, but as I’ve never been in love with Debbie Harry, I really can’t bear her “hey diddle diddle, the cat and the fiddle”-style rap. Like most of the hits of this period which don’t mean much to me, what I mostly associate with “The Tide Is High” are obscene playground variations, none of which bear repeating here, but all of which were, ultimately, far more entertaining. The bells alone on Rapture would have me hooked without the sensual, honeycombed, proto-David Lynch vocal. It’s very New York for me, as much as the 5 Satins’ In The Still Of The Night, the Drifters’ On Broadway, and Odyssey’s hit which received much Popular luv a few posts back. Was it just the UK radio edit which cut out the embarrassing “eats cars/eats bars” bit of the rap? I love the “Flash is fast, Flash is cool” section, which knocks the Clash’s appropriation (see the sad old men dancing in Clash On Broadway and lose any respect you may have had) of South Bronx culture for six. As for The Tide Is High, I agree with almost everyone – fun at the time, has worn badly and, once you’ve heard the Paragons’ version, it’s as limp and half-hearted (vocally at least) as the Detroit Spinners’ no.1 cover from the start of the year. Not as bad as Don McLean’s, mind. Mugging on the end raises a smile. I always think of this as the end as far as Blondie are concerned – even though Rapture and various reunions followed. It’s all a bit listless for my taste – which is not a quality I’d associate with them. Taylor nails the “hey diddle diddle, the cat and the fiddle”-style rap of Rapture as a source of irritation for me. Was it just the UK radio edit which cut out the embarrassing “eats cars/eats bars” bit of the rap? I have something here which claims to be the “original radio version” of “Rapture”, which is in fact a minute longer than the other version, and features the rap in all its glory. I don’t have any background on this – not really a Blondie historian – maybe someone else will? Does any song nosedive quite as badly as “Rapture”? The first two minutes are luscious: the groove is immaculate, THE BELLS, the entry of the vocals, like stepping into a moonbeam… and very few lyrics of its type are quite as good as “face to face / sadly, solitude / and it’s finger-popping / twenty-four hour shopping in rapture”. And then suddenly, the dish runs away with the spoon. Is she freestyling for most of that rap? I could swear she is (not just because the rhymes are so trite, but because of that weird, hesitant delivery). Anyway, I object to the second half of “Rapture”, because it’s such a desperate let-down, but also because I hate records that make me want to go off and listen to other records while they’re still playing, in this case “Sun Eye” by T Rex (“Lithon The Black, the rider of stars / Tyrannosaurus Rex, the eater of cars” – now that’s a lyric). I like rap too, Debbie is putting her own silly b-movie/pulp/pop art spin on the genre and not trying desperately hard to be “street”. A reminder of the days when hip-hop was fun. As is D Harry’s rapping on ‘Rapture’ – there are only a few select examples of a non-rapper rapping and getting away with it, but sadly I think she has to take some of the blame for the all the non-rappers who followed in her footsteps to disastrous effect. 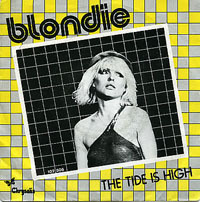 As for ‘The Tide Is High’, I thought it was OK in a blehhhh 6/10 way until I heard the original – it’s not, like, particularly great, but it’s amazing how much lightness and life Blondie sucked out of it (and surprising, as that’s not really something you could fault them with on their own material). If Debs had not been the lead singer of this lot, they would never have made it. This song is wretched and annoying when she starts squeaking and giggling at the end. She only gets away with such because all blokes who are not funny want to give her a portion. Boring song as someone said earlier and the backing music winds me up as well. Safely say I don’t like this but Id still happily take Debbie to go. I agree, nothing to see here. Interesting discussion on Rapture though. I had written it off until I saw it used in ‘We Own The Night’ and was amazed at just how beautiful it is. Listening to the full version again, I’d be amazed if it doesn’t exist as a massively curtailed edit, maybe pruning the rap down to six lines or so (‘Go out to the parking lot … Get up!’). Is there such a thing? I’d make it myself if I knew how. Although this hit version of the song is sung by a woman, the lyrics give it away as a man’s song, just like ‘Take A Chance On Me’. Agree with No23 if theyd not had every teenage boys fantasy figure as lead singer (and despite the “Blondie is a group” campaign back in the 70s to most people Blondie was Debbie Harry)as far as chart music goes we’d have never had heard of them. Admittedly some of the later stuff ‘Heart Of Glass’, ‘Atomic’ was ok but without the pin-up angle I dont think the very average pop-rock that preceded those singles would have put them in the position to make the later better stuff. Coincidentally the terrific Heatwave blog has just posted the latest incarnation of this song, and it’s much much better than Blondie’s – Kardinal Offishall and Keri Hilson have a fantastic new single, all booming drums and crunching synths, which interpolates the ‘Tide Is High’ hook – Hilson’s sweet take on it, esp when juxtaposed with the arrangement and Kardinal’s surprisingly ruffneck MCing, is definitely preferable to the perfunctory Blondie version.